This paper published on PNAS on Aug 15 addresses this big controversy by transgenically expressing human HTRA1 in mouse RPE. This paper shows that increased HTRA1 is sufficient to cause polypoidal choroidal vasculopathy (PCV) and occult choroidal neovascularization (CNV), two forms of wet AMD. PCV is a hemorrhagic disorder of the macula affecting the choroidal circulation. 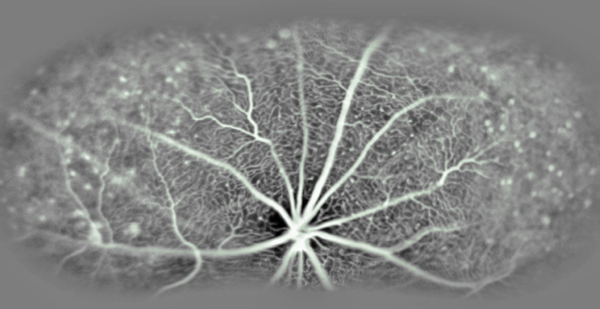 The characteristic lesion is an inner choroidal vascular network of vessels ending in an aneurysmal bulge or outward projection, a notable finding in wet AMD. The research team is led by Dr. Yingbin Fu, an assistant professor of Ophthalmology and an investigator at the Moran Center for Translational Medicine at the new Vision Institute of University of Utah. For some background, age-related macular degeneration (AMD) is a disease associated with aging that gradually destroys the central part of our vision. Age-related macular degeneration (AMD) is a leading cause of blindness in the elderly population in the world. In the United States, 1.75 million people are affected by AMD and 7 million people are at risk of developing AMD. AMD affects the macula of the retina, that central part of the retina with a high density of cone photoreceptors that allows you to see fine detail. It is principally this central vision that is needed for seeing objects clearly and for common daily tasks such as reading and driving. Behind the retina is the choroid, the vascular layer of the eye. Retinal pigment epithelium (RPE) is located between the retina and choroid. Degenerative changes in the RPE and choroid target the macula and cause AMD. 1. The precise role of HTRA1 in AMD. 2. The underlying cause for PCV. 3. Treatment strategy for PCV (no effective drug treatment is currently available) and CNV. 4. Why genetic variants at 10q26 are preferentially associated with wet AMD? 5. Why the progression of wet AMD is strongly correlated with increased elastin degradation? (Elastin is a major component of the vessel wall and the Bruch’s membrane, a physical barrier between the retina and RPE that prevents CNV). 6. Why PCV patients are resistant to anti-VEGF treatment. The image at top is an image of the choroidal and retinal vessels of a transgenic mouse overexpressing HTRA1 revealed by indocyanine green angiography (ICGA) showing wide distribution of choroidal lesions.